Town house with communal pool on a sort after development. The house is located close to shops, restaurants and all other amenities. 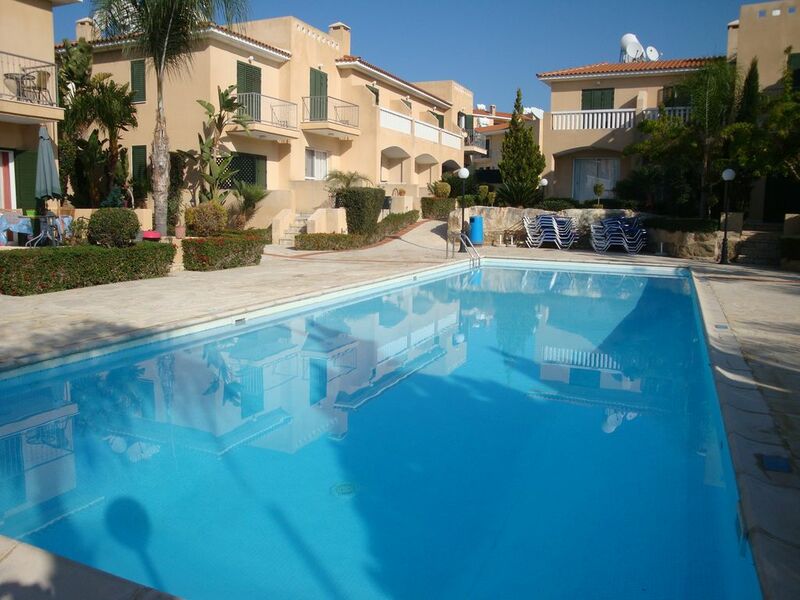 There are 2 good size bedrooms and an open plan kitchen/lounge area that leads out to the large pool, there is a downstairs toilet and a lovely terrace leading out to the pool where you will find sun beds and parasols for your use. There is air conditioning to the bedrooms and also ceiling fans and fly screens, there is internet access and a full UK TV package. The house has everything you will need for a very comfortable stay. The closest course is the challenging Tsada Golf Club (approx 40 minutes drive) established in 1994, the first course designed by Donald Steel. Par 72 - 6,855 yards and located amongst vineyards, next to a 12th century monastery it is bathed in cooling sea breezes in the summer season. There is a new club house currently under construction. Approximately 55 minutes drive away, you will find the Secret Valley Golf Club (Par 72 - 6,737 yards) a championship course surrounded by stunning rock formations and mature trees. Nearby is the Aphrodite Hills Golf Club (Par 71 - 6,855 yards) championship course designed by Cabell Robinson built on two plateaux which has spectacular views of the sea. Winery tours, boat hire, snorkeling, Jet ski hire, Glass Bottom Boat trips, museums, churches, Akamas trekking tours, jeep and quad bike safaris, an abundance of tavernas, traditional cafes and restaurants, horse riding, bird watching, or just lounge around and enjoy the simply amazing natural scenery from our wonderful villa. Car hire not essential as all amenities are close at hand but useful for trips to explore the amazing coast and countryside. Full directions from Paphos Airport will be provided on booking. Latchi 5 mins, Pomos Point and Harbour 15 minutes. Polis 5minutes. Paphos 35 minutes. Limassol 1.5 hours. Nicosia 2.5 hours. Larnaca 2.5 hours. This lovely house has everything you could ask for, Its on a quite development of 16 houses and the pool is right outside your gate. Its a perfect place to relax and unwind. The shops and restaurants are just a 10 minute stroll away. Air conditioning that will blow hot air or cool. Please note there is no air con in the living room.